Chopin is one the world’s most beloved composers and a much lauded hero in his native Poland. It’s Warsaw, where he resided for much of his life, that has taken him to the heart of their culture. Follow this guide to the attractions and events that honour a classical music legend. Fryderyk Chopin is one of Warsaw’s most enduring symbols, his music widely celebrated throughout the world. A child prodigy, he started learning piano at the astonishingly early age of 4 and by the age of 8 he had already performed at the Presidential Palace. 2010 saw the anniversary of this Polish legend which was marked nationally by The Year of Chopin, a celebration of his life and recognition of his importance in Polish national and cultural history. Although he was born in Zelawowa Wola about 50km away from the capital and was a keen traveller, spending time in many other European cities, especially Paris where he spent the other half of his life, it was in Warsaw, Poland that he studied and realised his musical genius and is literally where his heart now lies. Chopin has become a key part of Warsaw culture . Warsaw today is very different from Chopin’s Warsaw as wars have sadly ravaged the city and destroyed much of its former beauty. Yet there are still many remaining traces and customs of his past. 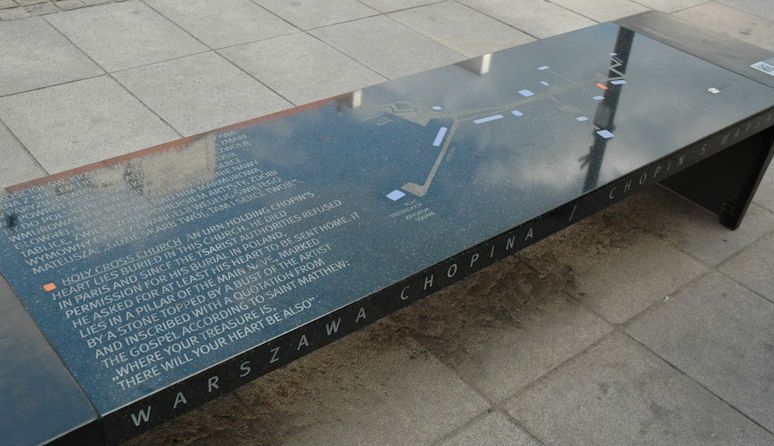 In 2010, the city of Warsaw recognized the importance of Chopin to its cultural history by mapping a trail of “Chopin’s Benches ” around the city where he spent the first half of his life. In one of the more unique Warsaw tours, each bench has a historic connection to his life and includes a special photo code where you can download some of his work and information about his life in different languages. Some of the most important from these 15 benches are: Saski Palace, where his family resided, and Czapski Palace where his family moved to in 1827. Another bench of significance is located outside Holy Cross Church, where his heart was interred in a pillar after being returned to his homeland from France where he died in 1849. It is said that he had a great fear of being buried alive and for this reason his body was cut open and his heart removed after his death. The rest of Chopin’s body is buried at the famous Pere-Lachaise Cemetery in Paris. You can also visit one of his benches by taking a walking tour in the peaceful Lazienki Park , also known as the “Royal Baths Park” because of the bathing pavilion once located here. 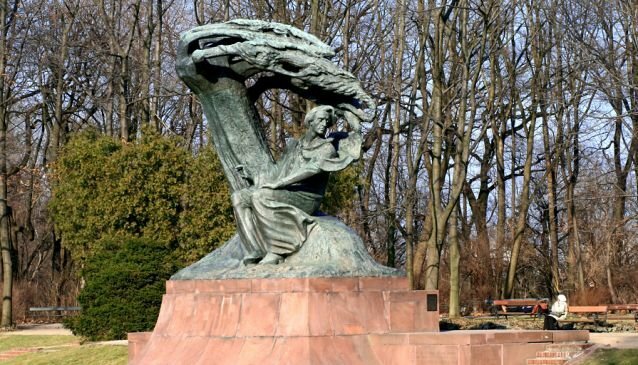 In the Chopin Garden a bronze statue was erected in 1926 depicting the composer sitting under a willow tree with the leaves seemingly like fingers plucking at the strings of his imagination. Free Chopin concerts are held here every weekend during the summer months carrying on a tradition of more than 50 years. These are one of the many summer Warsaw events not to be missed. 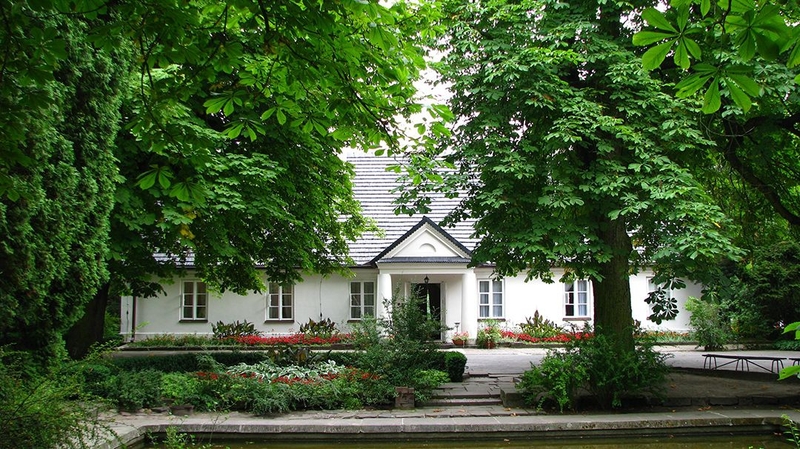 Ostrogski Palace is now the location of the Fryderyk Chopin Museum , one of the best museums in Warsaw and amongst the most modern biographical museums in Europe. In the 15 rooms you can get a feel of how he lived in Warsaw and Paris and explore the 5,000 exhibits taken from his life. This massive collection includes correspondence (there is even the last letter he wrote to his family before he died), a lock of hair, the passport he used to enter England, his school exercise books, a sweet box, paintings and sculptures including his death mask. You can also listen to his work and delve into the mind of the artist in a museum that is both engaging and interactive. Fryderyk Chopin is very much alive and well in Warsaw and continues to inspire in a city that is looking towards the future while respecting the importance of figures like Chopin from its illustrious past. Visit Warsaw to experience it for yourself. Take a break in the bustling capital by visiting one of the city's pleasant green areas. Experience the resurgence in Polish gastronomy from the low to the high-end. Coal industry or the people? Warsaw has seen tremendous changes in the years since it opened up to the world.